Glass kitchen worktops can transform your kitchen and offer your home a remarkable and stunning designer look. Not only do they give a feeling of greater space, they can be designed to be as individual as you. Whether you want to create a hygienic, waterproof, heat resistant work surface to inspire you each time you enter your kitchen or would simply like a uniquely different looking surface to be a talking point and leave a lasting impression on your friends, Splashbacks of Distinction can create this for you. All of the glass worktops that Splashbacks of Distinction supply can be produced for you in any shape, size and colour. All of the glass worktops we install are all made by glass manufacturing experts. This allows us to provide you with the best quality glass kitchen worktops. Because glass is perfectly flat and clear from either side, the worktop finish can be enhanced by different glass processing methods. Your kitchen worktop can be of any colour, shape or texture. Splashbacks of Distinction can help you realise your dream. There really is no limit to what can be achieved. Glass worktops and splashbacks can be produced as one off designs for domestic properties of any size or style. You don't need to own an up to the minute modern house to have a stylish glass worktop, they look fabulous in even the most traditional kitchen environments. Glass kitchen worktops can be one of the easiest and hygienic work surfaces to clean. Splashbacks of Distinction are able to install glass worktops that require far less cleaning than ceramics or laminated worktops. Our glass worktops are non stick and hygienically clean to a totally new level. After all, everything in the kitchen should be as hygienic as it can possibly be! 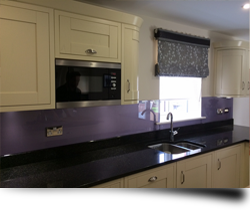 Splashbacks of Distinction also offer beautiful coloured glass worktops and we will ensure you get a perfect colour match every time. We can offer you thousands of colours to choose from or you can colour match your ideal colour. Your imagination and the sky really is the limit. This allows you to match your glass kitchen worktop to existing decor and cupboards, although we recommend that you have a coloured glass sample made up first so you can be absolutely confident that you have made the right choice before proceeding with your new glass worktop. Contact Splashbacks of Distinction now for more details on a coloured glass sample. Corian® has unrivalled beauty, strength and versatility built into its very nature. Ideal for a range of kitchen styles from the hi-tech to the traditional. Corian® offers extraordinary design flexibility and comes in over 100 different colours. These worktops are joined in a way that creates inconspicuous seams and a sleek, hygienic, non-porous surface. Corian® is ideal for worktops, splashbacks and integral sinks and many other exciting applications. Corian® kitchen worktops are installed with seamless and inconspicuous joints which offer a beautiful flowing worktop appearance. Corian® kitchen worktops are available in hundreds of colours and can be accompanied by a comprehensive range of sinks and bowls. Corian® worktops offer infinite design possibilities as the material can be formed to any shape. Corian® worktops can be designed with coved upstands and glass splashbacks combining your worktops with integral wall cladding. Corian® has a 10 year product warranty. The joints in Corian® worktops are inconspicuous providing a seamless worksurface. Any joints are blended by hand with abrasives so they are not visable. Due to thermal expansion Corian® can expand up to 1mm per metre of product. Any overhang that extends more than 300mm should be supported as this product is rather heavy. Splashbacks of Distinction offer a care and maintenance kit with new worktops, which has been developed to offer the customer everything they need to keep their worktops looking good for many years to come. Corian® kitchen worktops are not scratch proof, the use of chopping boards is highly recommended. Dark, heavily pigmented colours will show scratches. However these can be sanded out if required, just cal us at Splashbacks of Distinction and we'll be happy to repair you work surface at highly competitive rates. Corian® worktops are generally resistant but care must be taken to clean the worktops down as soon as practicable after a spillage. Corian® kitchen worktops can be repaired if damaged or scratched. Just give us a call at Splashbacks of Distinction and we'll be happy to help. Corian® kitchen worktops is naturally hygienic as the material is non porous and the seamless joints do not harbour any harmful bacteria.